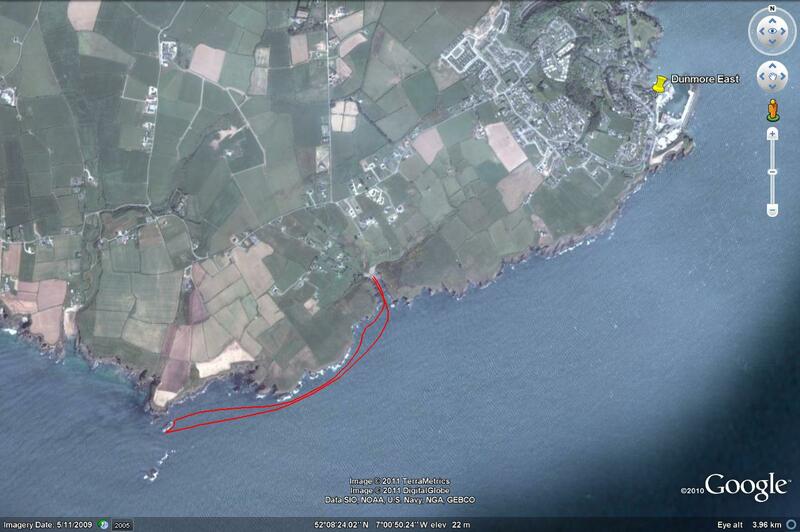 While I like visiting Dunmore the area isn’t one of my main swim locations. 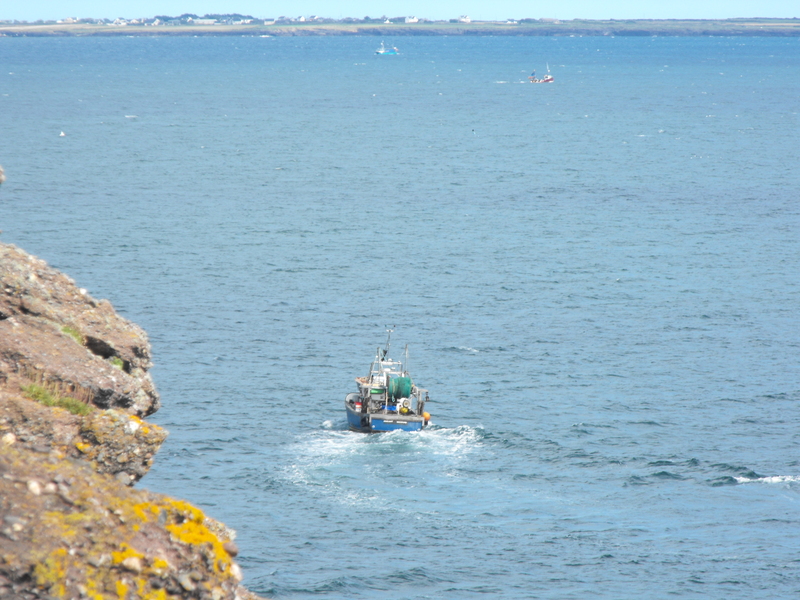 Anyhoo… Just outside Dunmore is Portally Cove. 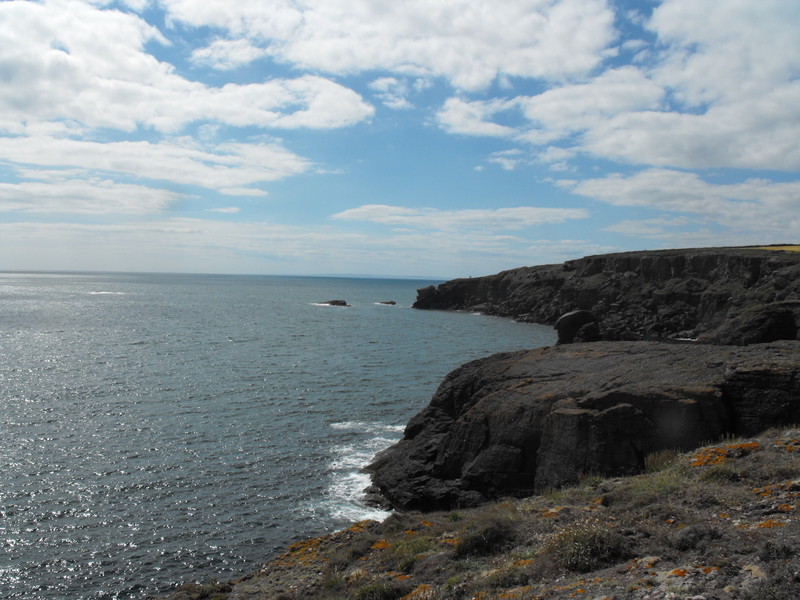 It’s a tiny sheltered cove, probably only 2 kilometres from the town, and is also connected by a cliff walk. In Portally, you actually feel quite isolated, and on a sunny summer day it’s like you are visiting the Aegean or somewhere, as the shallow cove seems quite green. 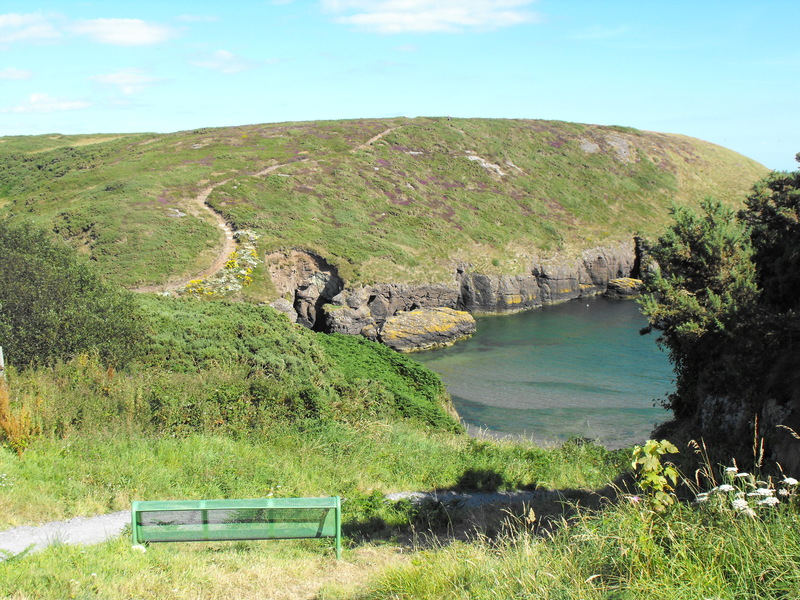 It’s only about 200 metres or less from the beach at high tide to outside the cove so for a swimmer, it’s attractive mainly because it’s sheltered but it’s too small for any swimming. I’ve made a few visits to investigate how useful it might be in the winter if I want a sheltered swim. 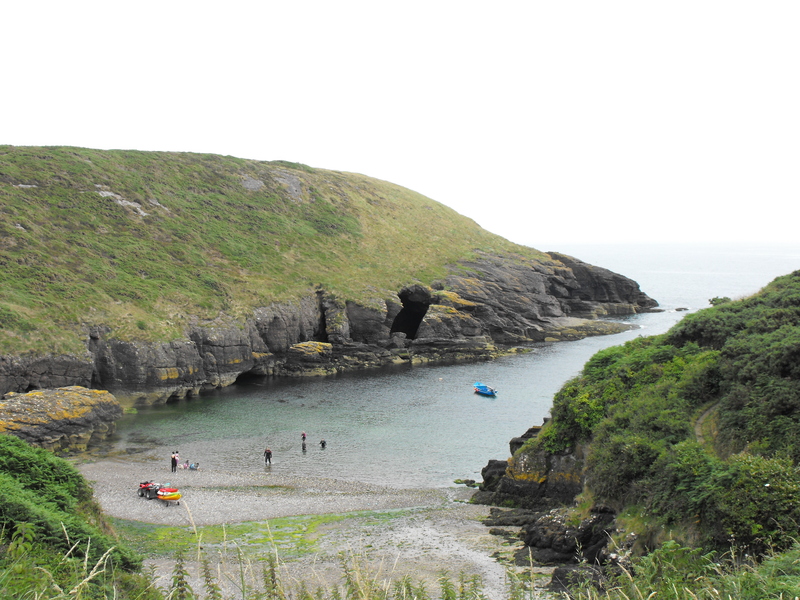 Dunmore East to Tramore or the Guillamene has been swam at least twice as far as I know (and one abandoned). There are pretty strong currents at various places along the coast. 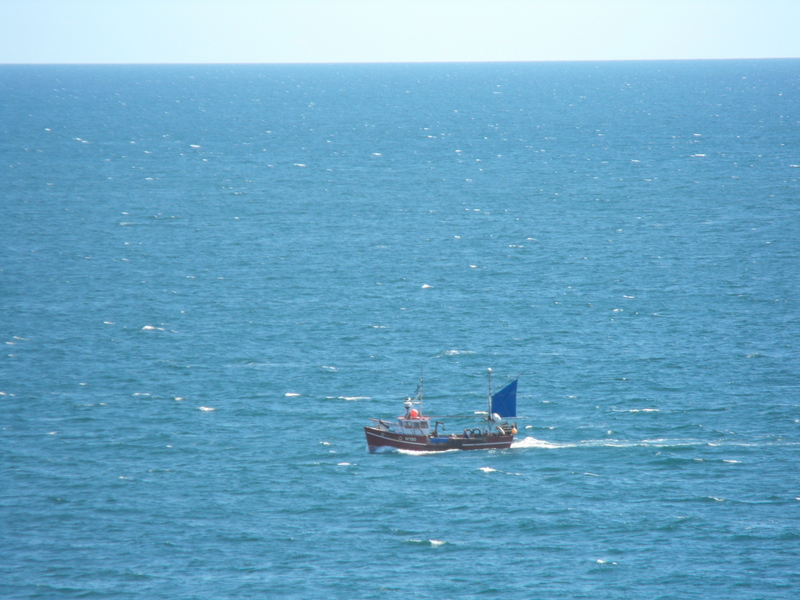 I’ve been out there once with Clare (the Tall Ships) and we also talked previously about the stretch of coast. So with some rare blueish sky and a light wind, I headed out. The beach is a mix and sand and stone that would be difficult in the winter, which was what I had in mind. The couple of rowing boats moored might be absent, hopefully because when moored they are held in place by ropes that stretch across the narrow cove just under the surface. Once outside the cove I headed right, i.e. west, toward Swines Head and Brownstown Head. It took me 20 minutes to swim those 500 metres, longer than it would normally take to swim a kilometre. It was a slog. The wind had picked up fractionally while I trudged across this section, into low Force Three. 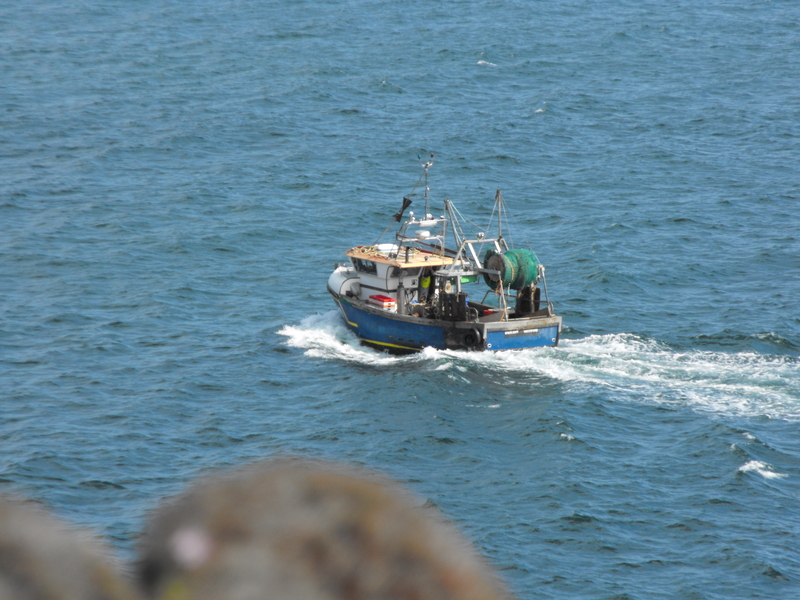 I eventually made the rock outside Swines Head, scaring off the resident cormorants and turned back. It had taken 40 minutes for the distance. Coming back I had the swell, current and wind behind me, and the return was ten minutes shorter. 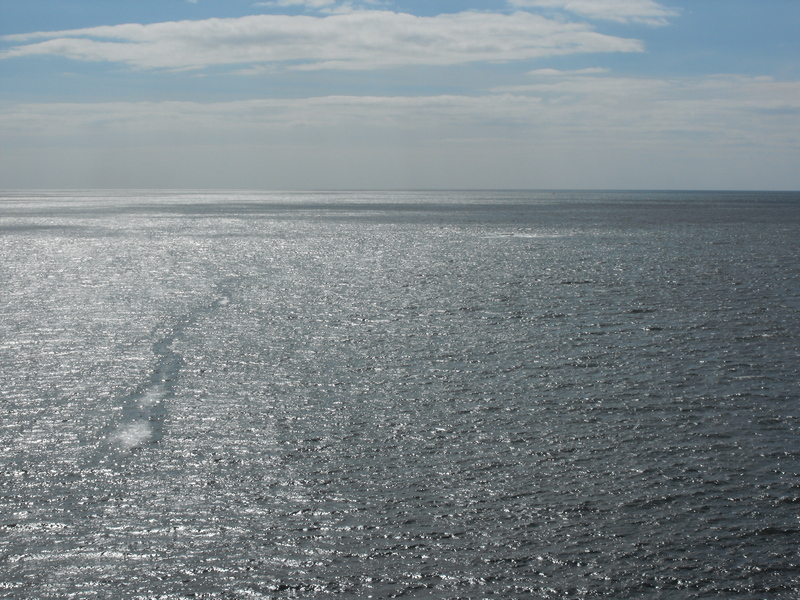 It’s a nice swim on a calm day, but the currents were difficult as predicted. It’s high tide only also for swimmers. There’s some great scenery, nice cliff walks on both sides but I doubt I’ll be adding it as a regular or even irregular swim. 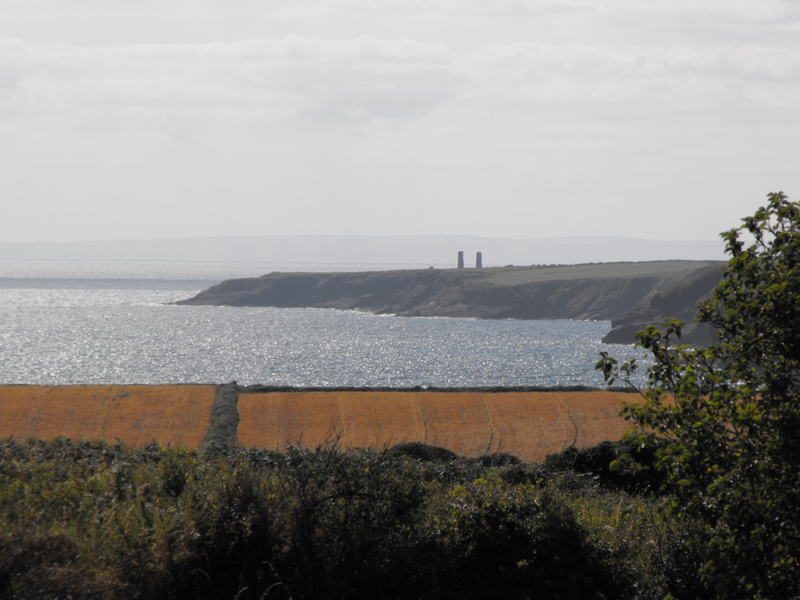 Eastward is the estuary into Waterford. 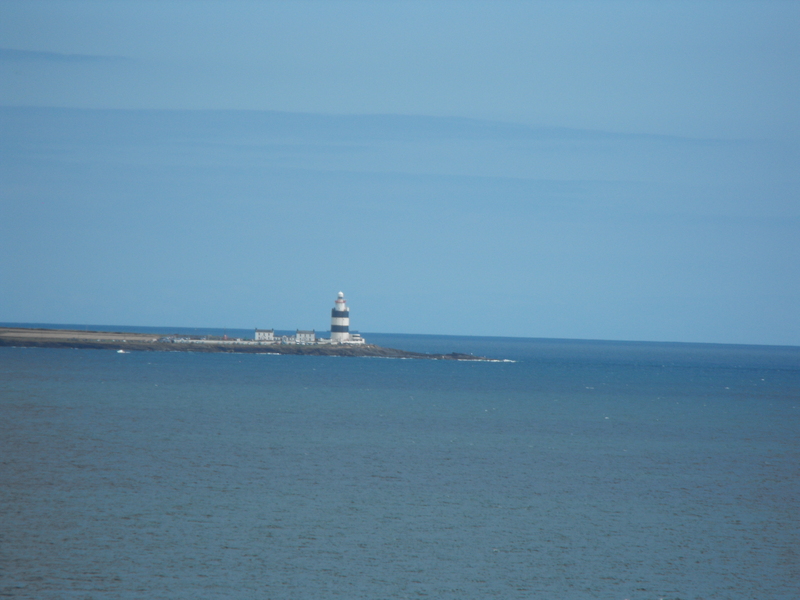 South east is Hook Head and Hook Head Lighthouse, the most geographically remote lighthouse in Ireland and the oldest operating lighthouse in the world. 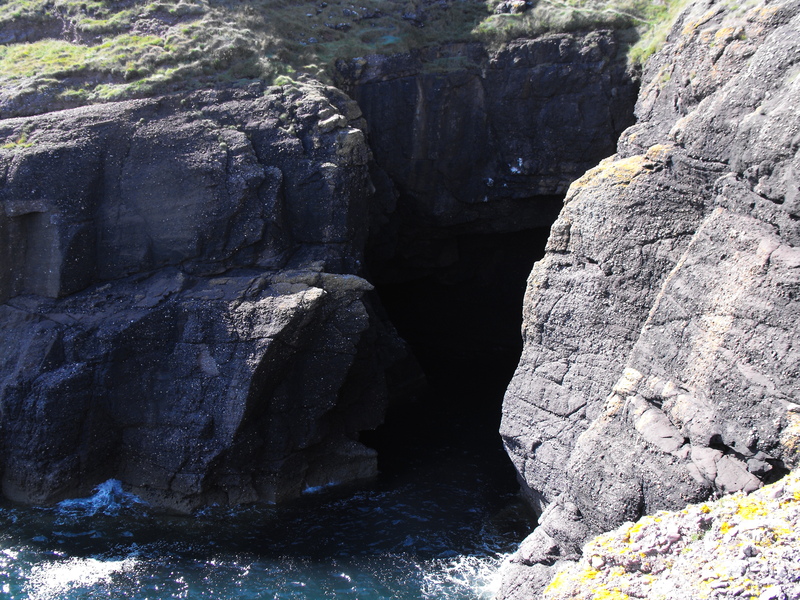 The waters of the Celtic Sea south-east of Ireland are dangerous. 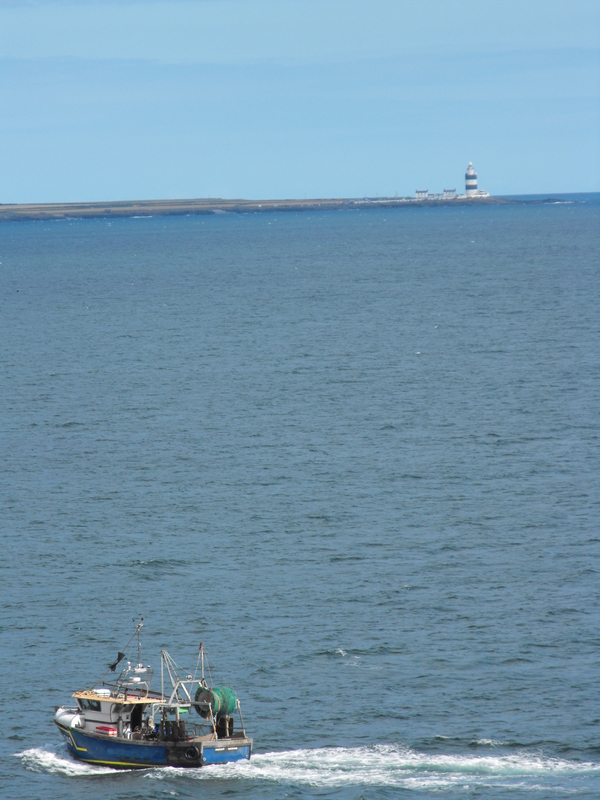 They become the Western Approaches the UK, made so famous during the Battle of the North Atlantic in World War Two. 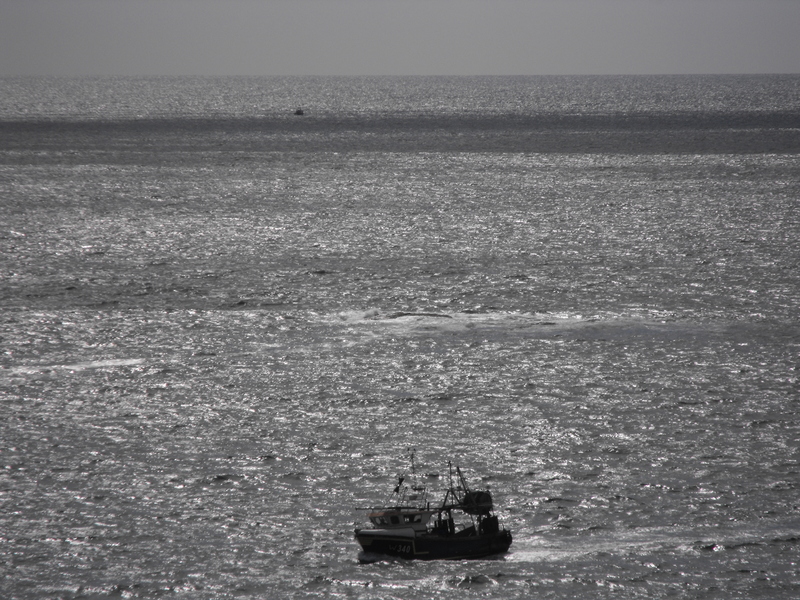 Fishermen and ships plying these waters are always at risk, as everywhere at sea, but the south-east is littered with wrecks and tragedies, even up until recently. 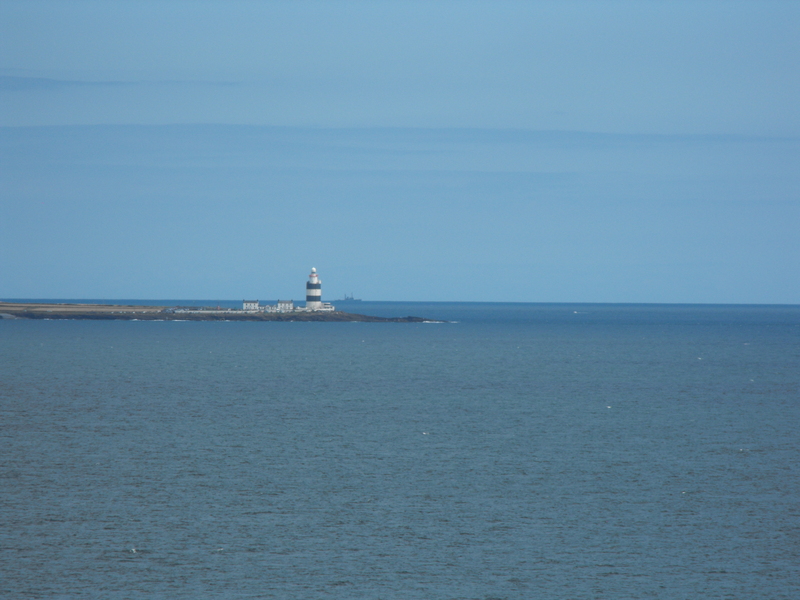 Coming into Waterford Estuary and Dunmore must always be a relief. Some of the colours of the South East in summer. My tagline for the site used to be “These are the colours of open water swimming”. Not just the water, but the sky and the sea-coast environment. 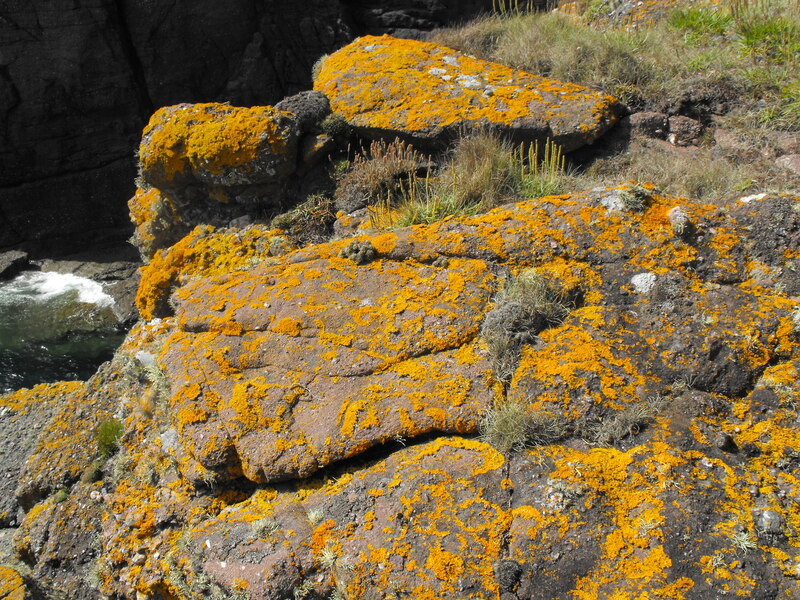 Yellow lichen on the cliffs. 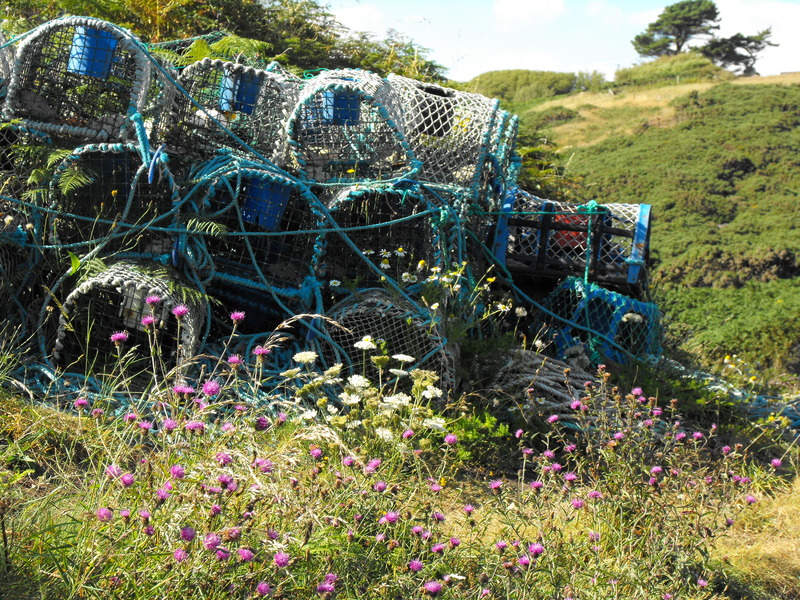 Fishing pots overgrown with thistles. 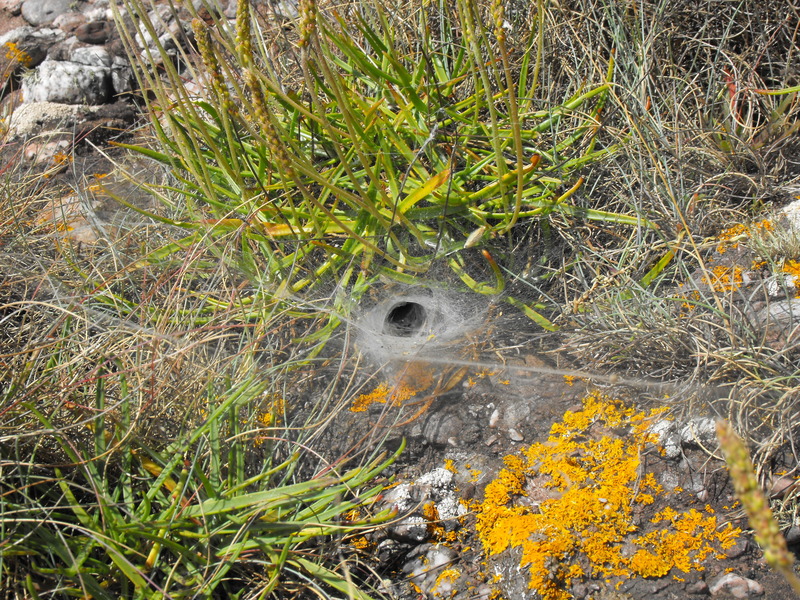 A funnel spiderweb and lichen. Who knows when we’ll get sufficient sun to appreciate these colours again?